¢ This is the most widely used medium for telecommunication. ¢ Twisted-pair wires are ordinary telephone wires which consist of two insulated copper wires twisted into pairs and are used for both voice and data transmission. ¢ The use of two wires twisted together helps to reduce crosstalk and electromagnetic induction. The transmission speed range from 2 million bits per second to 100 million bits per second. Coaxial cable carries signals of higher frequency ranges than twisted pair cable. It has a central core conductor of solid or stranded wire enclosed in an insulating sheath. This in turn encased in an outer conductor of metal foil ,braid or a combination of the two. The metallic wrapping serves both as a shield against noise and as the second conductor completes the circuit. The outer conductor is also enclosed in an insulating sheath and the whole cable is protected by a plastic cover. It has better shielding (protecting) than twisted pair, so that it can span longer distances at higher speeds. Widely used within telephone system for long-distances but now have largely been replaced by fiber optics. 75 ohm (Broadband coax): used for analog transmission and cable television. ¢ These cables are widely used for cable television systems, office buildings, and other worksites for local area networks. ¢ The cables consist of copper or aluminum wire wrapped with insulating layer typically of a flexible material with a high dielectric constant, all of which are surrounded by a conductive layer. ¢ The layers of insulation help minimize interference and distortion. It is used to connect the end of the cable to a device such as a TV set. It is used in Ethernet networks to branch out a cable for connection to a computer or other devices. It is used at the end of the cable to prevent the reflection of the signal. 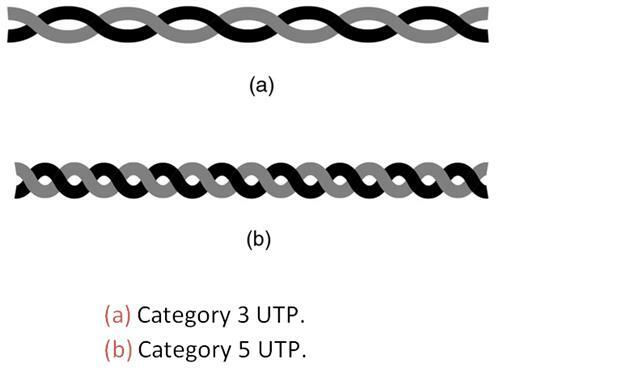 Attenuation is much higher in coaxial cables than in twisted pair cable. Coaxial cable has a much higher bandwidth the signal weakens rapidly and needs the frequent use of repeaters. A fiber optic cable is made of glass or plastic and transmit signals in the form of light. 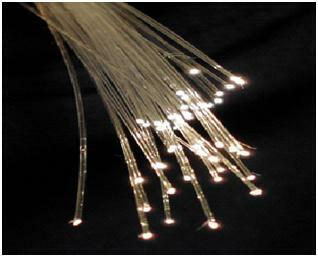 An optical fiber is a glass or plastic fiber that carries light along its length. Fiber optics is the overlap (part) of applied science and engineering concerned with the design and application of optical fibers. Optical fibers are widely used in fiber-optic communications, which permits transmission over longer distances and at higher bandwidths (data rates) than other forms of communications. Fibers are used instead of metal wires because signals travel along them with less loss, and they are also immune to electromagnetic interference. Fibers are also used for illumination (lighting), and are wrapped in bundles so they can be used to carry images, thus allowing viewing in tight spaces. Light travels in a straight line as long as it moves through a single uniform substance. If array traveling through one substance suddenly enters another the ray changes direction. If the angle of incidence (the angle the ray makes with the line perpendicular to the interface between the two substances) is less than the critical angle the ray refracts and moves closer to the surface. If the angle of incidence is greater than the critical angle the ray reflects and travels again in the denser substance. Optical fibers use reflection to guide light through a channel. (a) Three examples of a light ray from inside a silica fiber impinging on the air/silica boundary at different angles. (b) Light trapped by total internal reflection. ¢ These cables consist of one or more thin filaments of glass fiber wrapped in a protective layer. ¢ It transmits light which can travel over long distance and higher bandwidths. ¢ Fiber-optic cables are not affected by electromagnetic radiation. ¢ Transmission speed could go up to as high as trillions of bits per second. ¢ The speed of fiber optics is hundreds of times faster than coaxial cables and thousands of times faster than twisted-pair wire. Above 100 MHz, the waves travel in straight lines and can therefore be narrow focused. Since the microwave travel in a straight line, if the towers are too far apart, the earth’s surface will get in way. The higher the towers are, the further apart they can be. l The most common type of microwave antenna is called “dish”. A typical size is about 3 meters in diameter. l The antenna is fixed rigidly and focuses a narrow beam to achieve line-of-sight transmission to the receiving antenna. l Microwave antennas are usually located at a substantial heights above ground level to extend the range between antennas and to be able to transmit over the obstacles. l To achieve long distance transmission, a series of microwave relay towers is used, and the point-to-point microwave links are stung together over the desired distance. l Line-of-sight = transmission of very high frequency signals in straight lines directly from antenna to antenna. The primary use of terrestrial microwave system is telecommunications, as an alternative to coaxial cable op optical fiber. The microwave requires far fewer amplifiers and repeaters than coaxial cable over the same distance but requires line-of-sight transmission. - Microwave is commonly used for both voice and television transmission. Microwave is also used for short point-to-point links between buildings. This can be used for closed-circuit TV or as a data link between LANS. Cellular systems and fixed wireless access are also the important uses of microwave transmission. l A communication satellite is a microwave relay station. It is used to link two or more ground based microwave transmitters/receivers, known as ground stations. 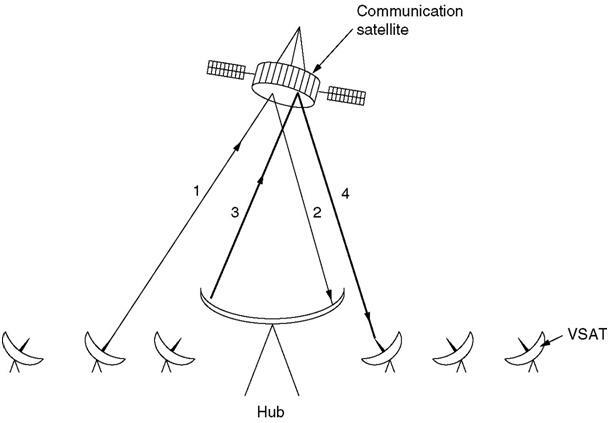 l The satellite receives transmissions one frequency band (uplink), amplifies it on another frequency (downlink). 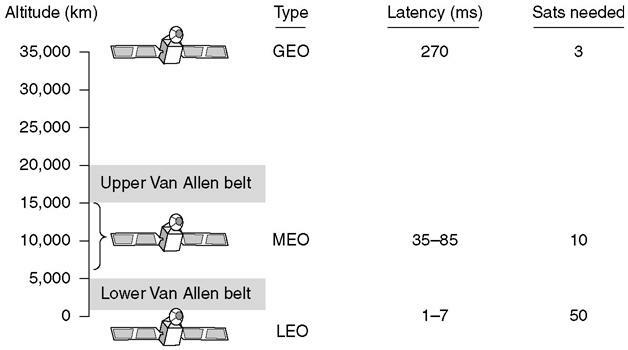 l A single orbiting satellite will operate on a number of frequency bands called transponders. l Following are the most important applications for satellites.